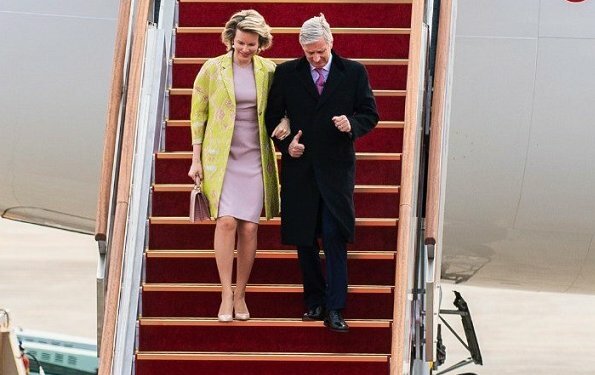 Belgian King Philippe and Queen Mathilde are making a 4 day state visit to South Korea on March 25-28. Various events have been planned in Seoul. 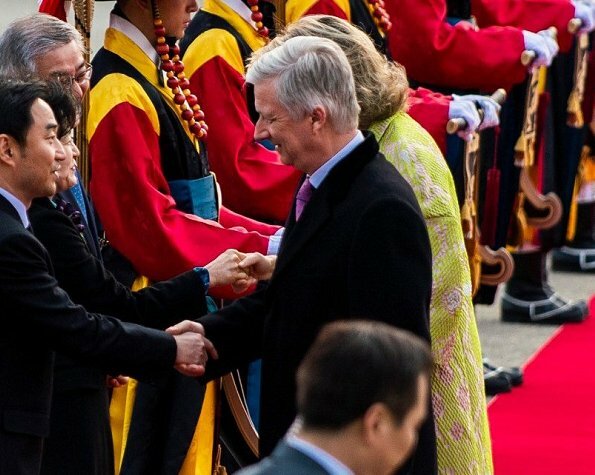 King Philippe will focus on promoting Belgian companies and businesses in South Korea. 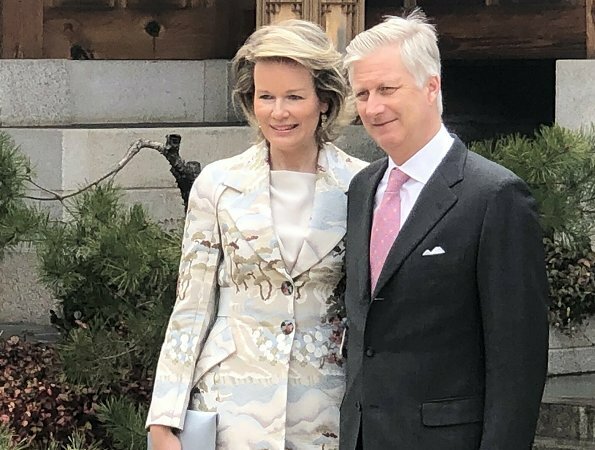 Queen Mathilde will attend events and meetings relating to education, children, mental health, the climate and the SDG’s. 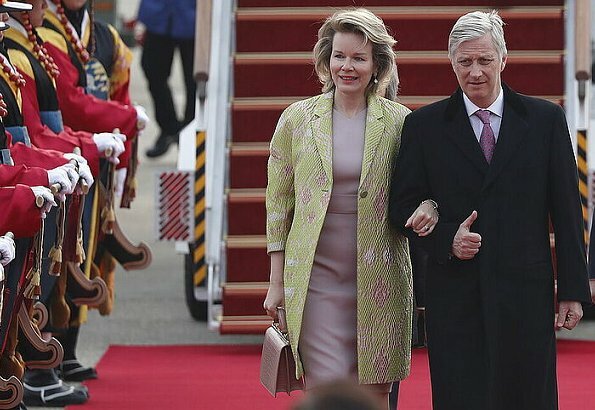 On March 25, The King and Queen of Belgium arrived at Seoul Air Base where they were welcomed by the Belgian Ambassador to South Korea, Peter Lescouhier. 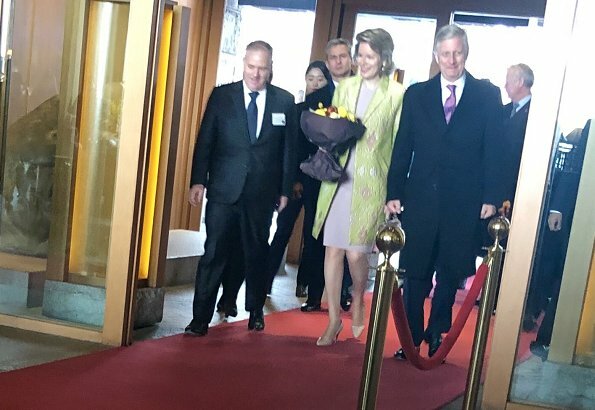 The Royal Couple then went to Grand Hyatt Seoul Hotel where they will rest. 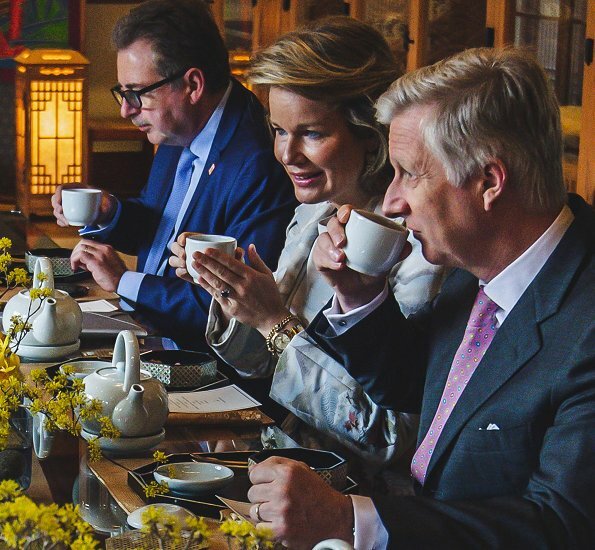 In the afternoon, The King and Queen visited Korea Furniture Museum. Love her coat/dresses n colours! 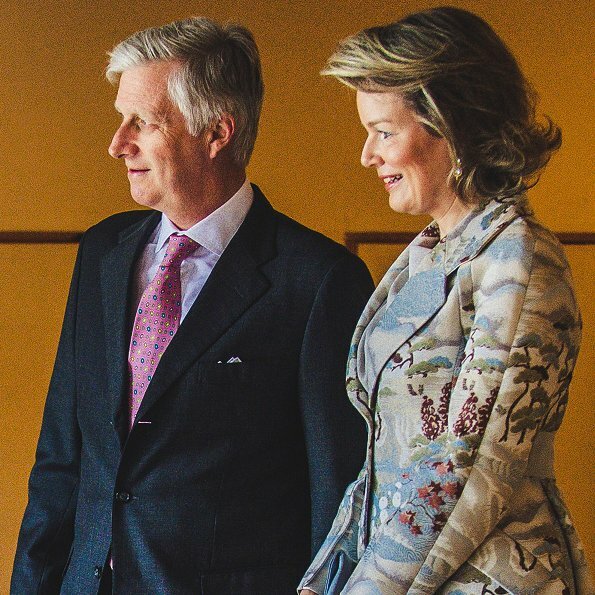 Agree, very flattering coat and colours on her and his tie matches beautifully. elegant and professional look of them. Not a big fan of any outfit here, but fashion has its rules... and difficult to be inovative. That is where Letizia is doing so well. Mathilde is so lovely and gracious. I often wonder if the fabrics in some outfits are more beautiful in person that in the photos. That's my guess on this one. 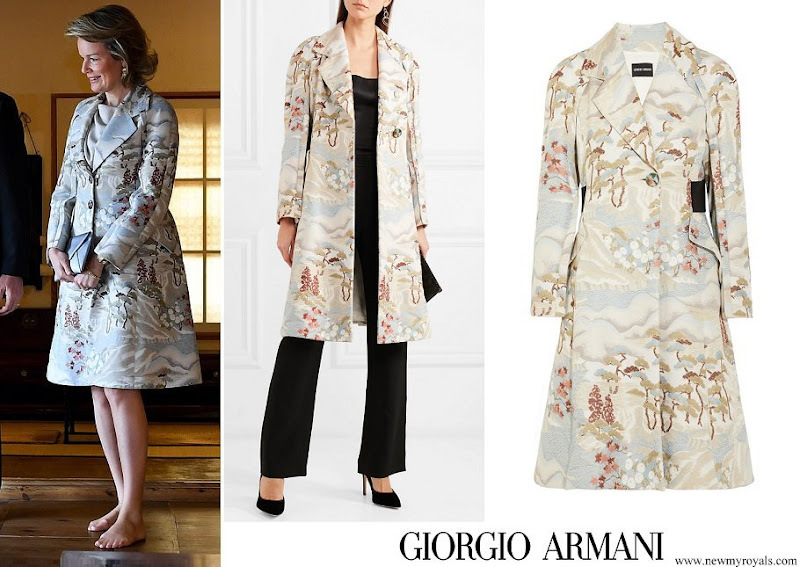 I love the coats and especially the oriental design on the second one. The color combination on the first outfit is unusual and pleasing. You can usually count on the king to choose some playfully-colored tie. He looks super, too! 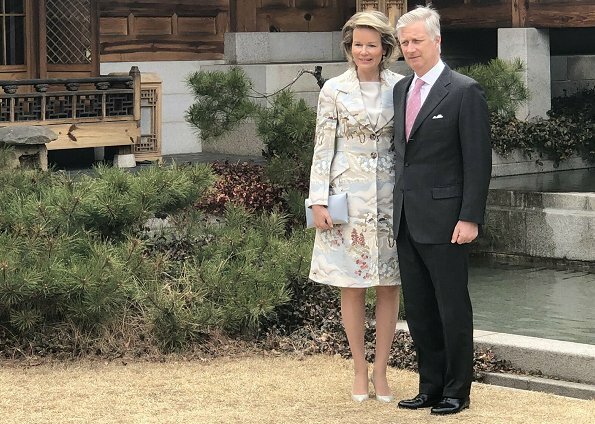 Q Mathilde looks fantastic on her State Visit to South Korea. I like the 2nd coat and dress ensemble the best.